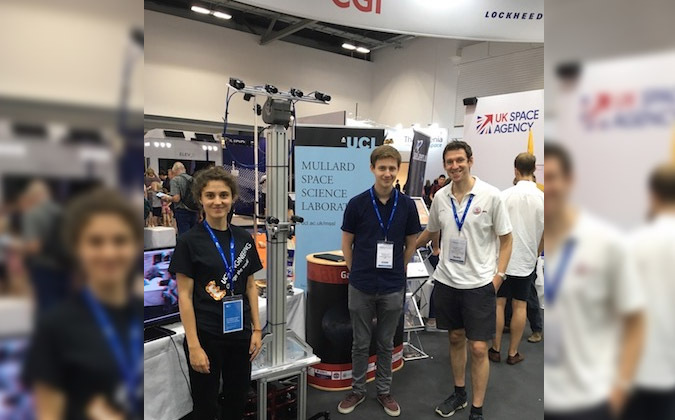 Students, post-docs and engineers from MSSL took part in the UK Space Agency (UKSA) public event at the Farnborough International Airshow this weekend. The UKSA stand aimed to engage members of the public in the wide-range of space activities taking part in the UK and to show the multitude of pathways into the space industry. MSSL showcased its involvement with the ESA Gaia mission and the upcoming ESA ExoMars mission. Members of the public encouraged to design their own stellar systems and learn about how data from Gaia will help understand the motion of stars and where mass is in our galaxy. There was also the opportunity to have their picture taken by the development model of PanCam and NavCam for the upcoming ESA ExoMars rover (which members of the public now have the opportunity to name) and learn how 3D images of the surface of Mars will change our understanding of the red planet. The MSSL team thanks everyone who came to talk to them and to the UKSA and Farnborough International Airshow for a great weekend.